The City of Oxford Public Works Department would like to alert you changes to the traffic patterns on Jefferson and Bramlett near Bramlett Elementary School. These changes will impact the parking areas and direction of travel when dropping your child off along Jefferson Avenue. In order to improve the safety of parents and students who are parking and walking along Jefferson Avenue, a loading and unloading zone has been added on Jefferson immediately adjacent to the existing sidewalk. Parents can park in the hashed area seen in the image below during the designated times and safely unload their children directly onto the sidewalk. This will allow all pedestrians to remain on the sidewalk and within designated crosswalks when exiting their car and walking to the school. The travel lanes along Jefferson will also be narrowed as a traffic calming measure. It will be important that parents planning to park and walk to the school approach Jefferson from Bramlett (as opposed to accessing it from the direction of the Square). It will not be permissible to make a U-turn on Jefferson to access the loading zone or to park in the opposite direction of oncoming traffic. It is also important that parents use the designated loading and unloading zones for everyone’s safety, rather than crossing Jefferson at various points along the road. 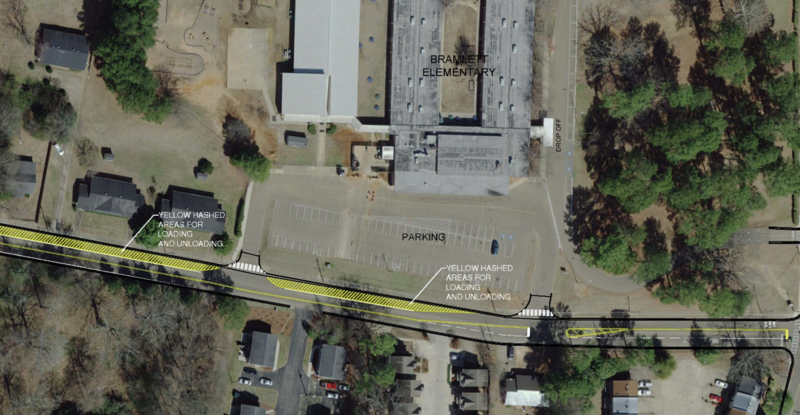 Striping changes were also made on Bramlett in order to more clearly mark the turn lane available to drivers making left turns into Bramlett Elementary School’s drive. Thank you for your cooperation and patience as we make these changes to improve safety on our roadways.